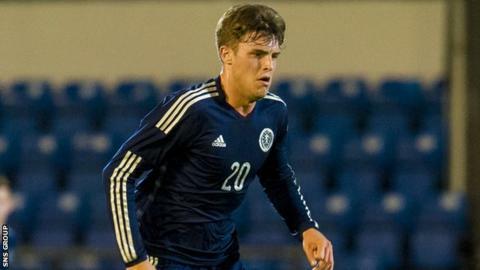 Muirhead's long-range strike for Scotland Under-19s against Norway is in the European governing body's top 10 for the 2014-15 campaign. Arsenal's Aaron Ramsay is on the list for his volley against Galatasaray. And Erik Lamela of Tottenham is included for his "rabona" finish in the win over Asteras Tripolis. The award will be decided by a public vote via the Uefa website and forms part of the organisation's 60-year anniversary celebrations. The shortlist, compiled by Uefa's football committee and Uefa technical observers, also includes Kevin De Bruyne, Vasyl Kobin, Vitorino Antunes and Belgium's female international Mariam Abdulai Toloba.